Available for Download @ Amazon! Photo ©2016 by Michael Borkson. Used with permission. A news story by Graham Rockingham in the Hamilton Spectator brings us details about the new song; it is not newly written, but is a song recorded in the "A Painter Passing Through" recording sessions at Grant Avenue Studios in Hamilton, ON. As reported, producer/engineer Bob Doidge, who has recorded Lightfoot since the mid 1990s, re-discovered a song, "Plans of My Own," that Lightfoot recorded - voice and guitar - and which had sat in the archives until now. Doidge loved the song, and sent it to Lightfoot who loved it too. He sent it on to Warner, and now we will all be able to enjoy it via streaming services. Also reported in the same article, Warner will be releasing an audiophile 180-gram vinyl record of "Summertime Dream," which of course includes the epic "Wreck of the Edmund Fitzgerald." An audiophile recording of that song should be stunning! This limited edition Record Store Day LP is available in my store here. And the LP will include a bonus track, "Betty Called Me In," a song previously available only on the Songbook Box Set, but will now be included on the audiophile release of the album it didn't make the first time. According to the Spectator article, the new song will be released on November 18th, and the audiophile vinyl on November 25th. Here's the full article in the Hamilton Spectator. Lightfoot is in the middle of his October US tour, and Bill Blankenship has provided a wonderful new interview. And this is an interview you must read to the end, because there at the bottom is the headline news, or at least my headline news - a new song! See the italicized paragraph in the interview below. It was the hula hoop that set Gordon Lightfoot's songwriting career in motion. Although he had been performing since age 5, Lightfoot, who is regarded as Canada's greatest songwriter, didn't write his first song until he was almost out of high school. "It just came to me to write a topical song about a fad. It was the hula hoop craze," Lightfoot, who will perform Tuesday night at the Topeka Performing Arts Center, 214 S.E. 8th, said by telephone from his home in Toronto. Lightfoot, who will turn 78 on Nov. 17, recalled that Life magazine devoted a cover story to the craze. "I sat down and I wrote a song about what I saw on the cover of this magazine," he said. "And being the adventurous person that I was at the time," Lightfoot, who had just learned how to drive, persuaded his father to let him drive his car 60 miles to the Toronto offices of BMI, the international publishing rights group. The young Lightfoot, guitar in hand, demoed "The Hula Hoop Song" for someone at BMI Canada, who ended the meeting with a thanks-but-no-thanks dismissal of "Leave your name with our receptionist and we'll call you." However, the guy also must have heard potential in Lightfoot's music and lyrics because he asked whether he had written anything else. "I don't even really know how to write music. I don't know anything about notation," Lightfoot told the man. "It was then that I decided that when I left high school I would go to music school, and that's exactly what I did," Lightfoot said. Lightfoot said he needed to learn how to put his music and lyrics on paper to protect his intellectual property rights through what is called a "poor man's copyright." That was the practice of sending the sheet music to one's self by registered mail, then leaving the letter unopened until it was needed in a plagiarism case to demonstrate who wrote the song first. "I've got a stack of those a foot thick in my house right now," he said with a chuckle. Eventually, all of Lightfoot's songs were properly registered. Those include such memorable ones as "Early Morning Rain," "If You Could Read My Mind," "Carefree Highway," "Sundown," "(That's What You Get) For Lovin Me," "The Wreck of the Edmund Fitzgerald," "Canadian Railroad Trilogy," "Ribbon of Darkness," "Beautiful," "Song for a Winter's Night" and "Rainy Day People." Those songs have made Lightfoot one of the best-selling folk-pop artists of all times, but he said his 220 songs and 20 albums pale in comparison to someone like Bob Dylan. "He has something like about 60 or 70 original albums. It's a huge output," Lightfoot said. While Dylan may have written many more songs than Lightfoot, Dylan has said, "I can't think of any Gordon Lightfoot song I don't like. Every time I hear a song of his, I wish it would last forever." Lightfoot said his catalog of songs might be larger were it not for what is required of him to create them. "With me it was cutting myself off from family, and it resulted in problems," said the three-time married Lightfoot, who though clean and sober has admitted to to resorting to alcohol and drugs as "stimulants" for songwriting. Lightfoot said he has to isolate himself to write. "Sometimes I would find a house that was standing empty and go and work there for a few days, here right in the city," he said. "Sometimes I would fly to Britain and go into a hotel room and write songs for five days, and fly home again back here in Toronto." "I remember when I wrote one of my best songs, get this, during a thunderstorm in downtown Cleveland in the middle of July," Lightfoot said. "I was using an apartment as a place to stay while I was working at La Cave, the folk club in Cleveland. It was quite a well-known club at the time. The song was called ‘Song for a Winter's Night.'" That song and many others written by Lightfoot have been recorded by scores of other singers, including Dylan, Elvis Presley, Johnny Cash, Hank Williams Jr., Marty Robbins, Jerry Lee Lewis, Judy Collins, Johnny Mathis, Anne Murray, Olivia Newton-John, Barbra Streisand, Peter Paul & Mary, Harry Belafonte, Jane's Addiction, Richie Havens, Glen Campbell, Toby Keith and George Hamilton IV. Asked what he thinks of how others have interpreted his material, Lightfoot responded: "I can tell you, I have never heard a cover recording that I did not like. The reason is I am so totally honored, just absolutely honored, that anyone would care enough to do one of my tunes." The 2012 Songwriters Hall of Fame inductee credits his desire to have his songs heard with helping him recover from an abdominal aortic aneurysm in 2002 that kills 95 percent of those who have them. "So the fact that I was among the 5 percent who survived, that was a bit of a miracle," he said. What helped Lightfoot recover, he said, was the desire to complete an album of songs he had written after he moved into a new home "at the request of my second old lady," he said, with a laugh. Lightfoot composed 18 songs and started recording them and rehearsing them with his band. "The guitar parts and the vocals were done," said Lightfoot, who from the hospital began directing his band on how to complete the album. "For the next 14 months, I never even thought about my condition," Lightfoot recalled. "I never thought about going into the hospital, going out of the hospital, healing, going back in, healing again. All I thought about was that record, and I was working on it even through the time of two different colostomies that I had to endure. I finished it, and it was my last album, ‘Harmony.' It's called ‘Harmony.'" 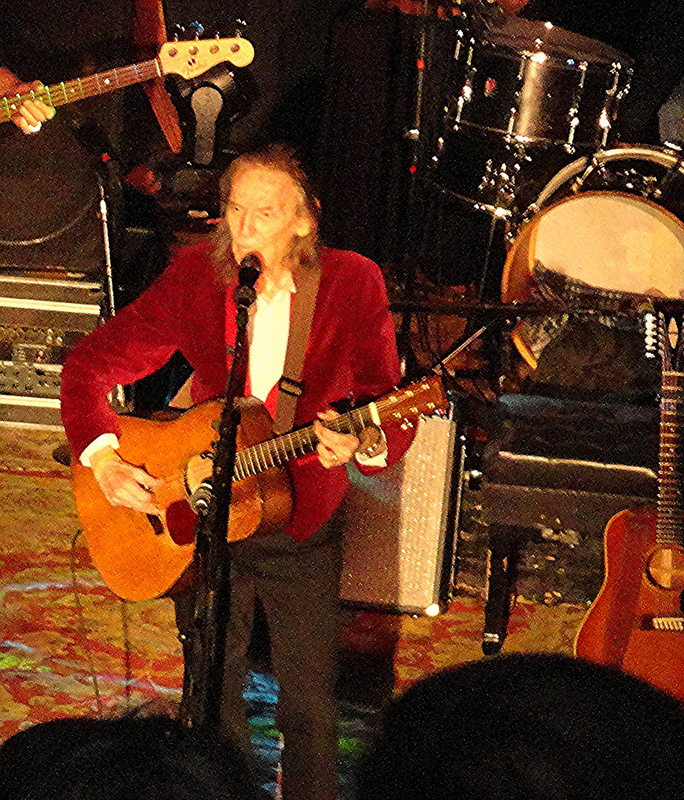 It took Lightfoot 28 months to return to the stage. "The first thing I did was a show that was a benefit for the hospital that looked after me the whole time," said Lightfoot. In 2006. Lightfoot suffered a minor stroke that left him unable to use the middle and ring fingers on his right hand. He was back performing nine days later. "I couldn't play, but my band carried the tune," he said. "I got back to normal after about five or six months, and I believe that I have about 98 percent strength back in my right hand." Lightfoot, who made his TPAC debut in 2009, said he remains eager to perform concerts, which he said includes his biggest hits, as well as some from deeper in his catalog. "We're all excited," he said of getting ready for the tour that will bring him to Topeka. "There are 14 people traveling in the party, and everybody's looking forward to it. Right now they're looking after family obligations here at home," said Lightfoot, who said he stays involved with four children and five grandchildren in the Toronto area. "Everybody looks after their business at home, and then we get out there and do the music," he said. "I have great fun with the crowd, I really do." And as for any new music from Lightfoot, he responded, "Between my third wife and my secretary, they are bound and determined that I'm going to put a single up, so we're going to do that." Lightfoot said his fans should look for Warner Bros. to release a single called "Plans of My Own" on Nov. 24. Published with permission from Bill Blankenship at the Topeka Capital-Journal. Original article posted at the newspaper's web site cjonline.com.